A political spectrum is a system of classifying different political positions upon one or more geometric axes that represent independent political dimensions. Most long-standing spectra include a left wing, which originally referred to seating arrangements in the French parliament after the Revolution (1789–1799). On a left–right spectrum, communism and socialism are usually regarded internationally as being on the left, Liberalism can mean different things in different contexts: sometimes on the left (social liberalism). Those with an intermediate outlook are sometimes classified as centrists. That said, liberals and neoliberals are often called centrists too. Politics that rejects the conventional left–right spectrum is often known as syncretic politics, though the label tends to mischaracterize positions that have a logical location on a two-axis spectrum because they seem randomly brought together on a one-axis left-right spectrum. Political scientists have frequently noted that a single left–right axis is insufficient for describing the existing variation in political beliefs and often include other axes. Though the descriptive words at polar opposites may vary, often in popular biaxial spectra the axes are split between socio-cultural issues and economic issues, each scaling from some form of individualism (or government for the freedom of the individual) to some form of communitarianism (or government for the welfare of the community). The terms right and left refer to political affiliations originating early in the French Revolutionary era of 1789–1799 and referred originally to the seating arrangements in the various legislative bodies of France. As seen from the Speaker's seat at the front of the Assembly, the aristocracy sat on the right (traditionally the seat of honor) and the commoners sat on the left, hence the terms right-wing politics and left-wing politics. Originally, the defining point on the ideological spectrum was the Ancien Régime ("old order"). "The Right" thus implied support for aristocratic or royal interests and the church, while "The Left" implied support for republicanism, secularism and civil liberties. Because the political franchise at the start of the revolution was relatively narrow, the original "Left" represented mainly the interests of the bourgeoisie, the rising capitalist class (with notable exceptions such as the proto-communist Gracchus Babeuf). Support for laissez-faire commerce and free markets were expressed by politicians sitting on the left because these represented policies favorable to capitalists rather than to the aristocracy, but outside parliamentary politics these views are often characterized as being on the Right. The reason for this apparent contradiction lies in the fact that those "to the left" of the parliamentary left, outside official parliamentary structures (such as the sans-culottes of the French Revolution), typically represent much of the working class, poor peasantry and the unemployed. Their political interests in the French Revolution lay with opposition to the aristocracy and so they found themselves allied with the early capitalists. However, this did not mean that their economic interests lay with the laissez-faire policies of those representing them politically. As capitalist economies developed, the aristocracy became less relevant and were mostly replaced by capitalist representatives. The size of the working class increased as capitalism expanded and began to find expression partly through trade unionist, socialist, anarchist and communist politics rather than being confined to the capitalist policies expressed by the original "left". This evolution has often pulled parliamentary politicians away from laissez-faire economic policies, although this has happened to different degrees in different countries, especially those with a history of issues with more authoritarian-left countries, such as the Soviet Union or China under Mao Zedong. Thus the word "Left" in American political parlance may refer to "liberalism" and be identified with the Democratic Party, whereas in a country such as France these positions would be regarded as relatively more right-wing, or centrist overall, and "left" is more likely to refer to "socialist" or "social-democratic" positions rather than "liberal" ones. For almost a century, social scientists have considered the problem of how best to describe political variation. In 1950, Leonard W. Ferguson analyzed political values using ten scales measuring attitudes toward: birth control, capital punishment, censorship, communism, evolution, law, patriotism, theism, treatment of criminals and war. Submitting the results to factor analysis, he was able to identify three factors, which he named religionism, humanitarianism and nationalism. He defined religionism as belief in God and negative attitudes toward evolution and birth control; humanitarianism as being related to attitudes opposing war, capital punishment and harsh treatment of criminals; and nationalism as describing variation in opinions on censorship, law, patriotism and communism. This system was derived empirically, as rather than devising a political model on purely theoretical grounds and testing it, Ferguson's research was exploratory. As a result of this method, care must be taken in the interpretation of Ferguson's three factors, as factor analysis will output an abstract factor whether an objectively real factor exists or not. Although replication of the nationalism factor was inconsistent, the finding of religionism and humanitarianism had a number of replications by Ferguson and others. Shortly afterward, Hans Eysenck began researching political attitudes in Great Britain. He believed that there was something essentially similar about the National Socialists (Nazis) on the one hand and the communists on the other, despite their opposite positions on the left–right axis. As Hans Eysenck described in his 1956 book Sense and Nonsense in Psychology, Eysenck compiled a list of political statements found in newspapers and political tracts and asked subjects to rate their agreement or disagreement with each. Submitting this value questionnaire to the same process of factor analysis used by Ferguson, Eysenck drew out two factors, which he named "Radicalism" (R-factor) and "Tender-Mindedess" (T-factor). Such analysis produces a factor whether or not it corresponds to a real-world phenomenon and so caution must be exercised in its interpretation. While Eysenck's R-factor is easily identified as the classical "left–right" dimension, the T-factor (representing a factor drawn at right angles to the R-factor) is less intuitive, as high-scorers favored pacifism, racial equality, religious education and restrictions on abortion, while low-scorers had attitudes more friendly to militarism, harsh punishment, easier divorce laws and companionate marriage. Despite the difference in methodology, location and theory, the results attained by Eysenck and Ferguson matched. Simply rotating Eysenck's two factors 45 degrees renders the same factors of religionism and humanitarianism identified by Ferguson in America. Eysenck's dimensions of R and T were found by factor analyses of values in Germany and Sweden, France and Japan. One interesting result Eysenck noted in his 1956 work was that in the United States and Great Britain, most of the political variance was subsumed by the left/right axis, while in France the T-axis was larger and in the Middle East the only dimension to be found was the T-axis: "Among mid-Eastern Arabs it has been found that while the tough-minded/tender-minded dimension is still clearly expressed in the relationships observed between different attitudes, there is nothing that corresponds to the radical-conservative continuum". Eysenck's political views related to his research: Eysenck was an outspoken opponent of what he perceived as the authoritarian abuses of the left and right and accordingly he believed that with this T axis he had found the link between nazism and communism. According to Eysenck, members of both ideologies were tough-minded. Central to Eysenck's thesis was the claim that tender-minded ideologies were democratic and friendly to human freedoms, while tough-minded ideologies were aggressive and authoritarian, a claim that is open to political criticism. In this context, Eysenck carried out studies on nazism and communist groups, claiming to find members of both groups to be more "dominant" and more "aggressive" than control groups. Eysenck left Nazi Germany to live in Britain and was not shy in attacking Stalinism, noting the anti-Semitic prejudices of the Russian government, the luxurious lifestyles of the Soviet Union leadership and the Orwellian "doublethink" of East Germany's naming itself the German Democratic Republic despite being "one of the most undemocratic regimes in the world today". While Eysenck was an opponent of Nazism, his relationship with fascist organizations was more complex. Eysenck himself lent theoretical support to the English National Party (which also opposed "Hitlerite" Nazism) and was interviewed in the first issue of their journal The Beacon in relation to his controversial views on relative intelligence between different races. At one point during the interview, Eysenck was asked whether or not he was of Jewish origin before the interviewer proceeded. His political allegiances were called into question by other researchers, notably Steven Rose, who alleged that his scientific research was used for political purposes. Eysenck's conception of tough-mindedness has been criticized for a number of reasons. Virtually no values were found to load only on the tough/tender dimension. The interpretation of tough-mindedness as a manifestation of "authoritarian" versus tender-minded "democratic" values was incompatible with the Frankfurt school's single-axis model, which conceptualized authoritarianism as being a fundamental manifestation of conservatism and many researchers took issue with the idea of "left-wing authoritarianism". The theory which Eysenck developed to explain individual variation in the observed dimensions, relating tough-mindedness to extroversion and psychoticism, returned ambiguous research results. Eysenck's finding that Nazis and communists were more tough-minded than members of mainstream political movements was criticised on technical grounds by Milton Rokeach. Eysenck's method of analysis involves the finding of an abstract dimension (a factor) that explains the spread of a given set of data (in this case, scores on a political survey). This abstract dimension may or may not correspond to a real material phenomenon and obvious problems arise when it is applied to human psychology. The second factor in such an analysis (such as Eysenck's T-factor) is the second best explanation for the spread of the data, which is by definition drawn at right angles to the first factor. While the first factor, which describes the bulk of the variation in a set of data, is more likely to represent something objectively real, subsequent factors become more and more abstract. Thus one would expect to find a factor that roughly corresponds to "left" and "right", as this is the dominant framing for politics in our society, but the basis of Eysenck's "tough/tender-minded" thesis (the second, T-factor) may well represent nothing beyond an abstract mathematical construct. Such a construct would be expected to appear in factor analysis whether or not it corresponded to something real, thus rendering Eysenck's thesis unfalsifiable through factor analysis. Dissatisfied with Hans J. Eysenck's work, Milton Rokeach developed his own two-axis model of political values in 1973, basing this on the ideas of freedom and equality, which he described in his book, The Nature of Human Values. Milton Rokeach claimed that the defining difference between the left and right was that the left stressed the importance of equality more than the right. Despite his criticisms of Eysenck's tough-tender axis, Rokeach also postulated a basic similarity between communism and nazism, claiming that these groups would not value freedom as greatly as more conventional social democratics, democratic socialists and capitalists would and he wrote that "the two value model presented here most resembles Eysenck's hypothesis". To test this model, Milton Rokeach and his colleagues used content analysis on works exemplifying nazism (written by Adolf Hitler), communism (written by Vladimir Lenin), capitalism (by Barry Goldwater) and socialism (written by various socialist authors). This method has been criticized for its reliance on the experimenter's familiarity with the content under analysis and its dependence on the researcher's particular political outlooks. Later studies using samples of American ideologues and American presidential inaugural addresses attempted to apply this model. In further research, Hans J. Eysenck refined his methodology to include more questions on economic issues. Doing this, he revealed a split in the left–right axis between social policy and economic policy, with a previously undiscovered dimension of socialism-capitalism (S-factor). While factorially distinct from Eysenck's previous R factor, the S-factor did positively correlate with the R-factor, indicating that a basic left–right or right–left tendency underlies both social values and economic values, although S tapped more into items discussing economic inequality and big business, while R relates more to the treatment of criminals and to sexual issues and military issues. Most research and political theory since this time has replicated the factors shown above. Another replication came from Ronald Inglehart's research into national opinions based on the World Values Survey, although Inglehart's research described the values of countries rather than individuals or groups of individuals within nations. Inglehart's two-factor solution took the form of Ferguson's original religionism and humanitarianism dimensions; Inglehart labelled them "secularism–traditionalism", which covered issues of tradition and religion, like patriotism, abortion, euthanasia and the importance of obeying the law and authority figures, and "survivalism – self expression", which measured issues like everyday conduct and dress, acceptance of diversity (including foreigners) and innovation and attitudes towards people with specific controversial lifestyles such as homosexuality and vegetarianism, as well as willingness to engage in political activism. See for Inglehart's national chart. The Nolan chart was created by libertarian David Nolan. This chart shows what he considers as "economic freedom" (issues like taxation, free trade and free enterprise) on the horizontal axis and what he considers as "personal freedom" (issues like drug legalization, abortion and the draft) on the vertical axis. This puts left-wingers in the left quadrant, libertarians in the top, right-wingers in the right and what Nolan originally named populists in the bottom. The political compass has two axes. One represents economic issues as right-vs-left. The other represents issues of freedom, or social issues, as authoritarian-vs-libertarian. One can determine their position on the political compass through an online quiz by the same name. In a 2003 Psychological Bulletin paper, Jeff Greenberg and Eva Jonas posit a model comprising the standard left–right axis and an axis representing ideological rigidity. For Greenberg and Jonas, ideological rigidity has "much in common with the related concepts of dogmatism and authoritarianism" and is characterized by "believing in strong leaders and submission, preferring one’s own in-group, ethnocentrism and nationalism, aggression against dissidents, and control with the help of police and military". Greenberg and Jonas posit that high ideological rigidity can be motivated by "particularly strong needs to reduce fear and uncertainty" and is a primary shared characteristic of "people who subscribe to any extreme government or ideology, whether it is right-wing or left-wing". This very distinct two-axis model was created by Jerry Pournelle in 1963 for his doctoral dissertation in political science. The Pournelle chart has liberty on one axis, with those on the left seeking freedom from control or protections for social deviance and those on the right emphasizing state authority or protections for norm enforcement (farthest right being state worship, farthest left being the idea of a state as the "ultimate evil"). The other axis is rationalism, defined here as the belief in planned social progress, with those higher up believing that there are problems with society that can be rationally solved and those lower down skeptical of such approaches. In its 4 January 2003 issue, The Economist discussed a chart, proposed by Dr. Ronald Inglehart and supported by the World Values Survey (associated with the University of Michigan), to plot cultural ideology onto two dimensions. On the y-axis it covered issues of tradition and religion, like patriotism, abortion, euthanasia and the importance of obeying the law and authority figures. At the bottom of the chart is the traditionalist position on issues like these (with loyalty to country and family and respect for life considered important), while at the top is the secular position. The x-axis deals with self-expression, issues like everyday conduct and dress, acceptance of diversity (including foreigners) and innovation, and attitudes towards people with specific controversial lifestyles such as vegetarianism, as well as willingness to engage in political activism. At the right of the chart is the open self-expressionist position, while at the left is its opposite position, which Dr. Inglehart calls survivalist. This chart not only has the power to map the values of individuals, but also to compare the values of people in different countries. Placed on this chart, European Union countries in continental Europe come out on the top right, Anglophone countries on the middle right, Latin American countries on the bottom right, African, Middle Eastern and South Asian countries on the bottom left and ex-Communist countries on the top left. Mitchell charts these traditions graphically using a vertical axis as a scale of kratos/akrateia and a horizontal axis as a scale of archy/anarchy. He places democratic progressivism in the lower left, plutocratic nationalism in the lower right, republican constitutionalism in the upper right, and libertarian individualism in the upper left. The political left is therefore distinguished by its rejection of archy, while the political right is distinguished by its acceptance of archy. For Mitchell, anarchy is not the absence of government but the rejection of rank. Thus there can be both anti-government anarchists (Mitchell’s "libertarian individualists") and pro-government anarchists (Mitchell's "democratic progressives", who favor the use of government force against social hierarchies such as patriarchy). Mitchell also distinguishes between left-wing anarchists and right-wing anarchists, whom Mitchell renames "akratists" for their opposition to the government’s use of force. From the four main political traditions, Mitchell identifies eight distinct political perspectives diverging from a populist center. 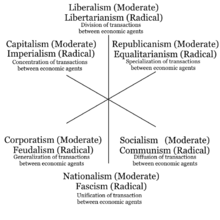 Four of these perspectives (Progressive, Individualist, Paleoconservative, and Neoconservative) fit squarely within the four traditions; four others (Paleolibertarian, Theoconservative, Communitarian, and Radical) fit between the traditions, being defined by their singular focus on rank or force. Anthony Gregory of the Independent Institute credits Mitchell with "the best explanation of the political spectrum", saying he "makes sense of all the major mysteries". One alternative spectrum offered by the conservative American Federalist Journal accounts for only the "degree of government control" without consideration for any other social or political variable and thus places "fascism" (totalitarianism) at one extreme and "anarchism" (no government at all) at the other extreme. The Vosem Chart, or Vosem Cube, is based on the Nolan Chart and adds a third axis for corporate issues, depicted three dimensionally, with eight discrete categories representing eight different political ideologies. Vosem is the Russian word for "eight." The spatial model of voting plots voters and candidates in a multi-dimensional space where each dimension represents a single political issue sub-component of an issue, or candidate attribute. Voters are then modeled as having an "ideal point" in this space and voting for the nearest candidates to that point. The dimensions of this model can also be assigned to non-political properties of the candidates, such as perceived corruption, health, etc. Most of the other spectra in this article can then be considered projections of this multi-dimensional space onto a smaller number of dimensions. For example, a study of German voters found that at least four dimensions were required to adequately represent all political parties. In 1998, political author Virginia Postrel, in her book The Future and Its Enemies, offered another single-axis spectrum that measures views of the future, contrasting stasists, who allegedly fear the future and wish to control it, and dynamists, who want the future to unfold naturally and without attempts to plan and control. The distinction corresponds to the utopian versus dystopian spectrum used in some theoretical assessments of liberalism and the book's title is borrowed from the work of the anti-utopian classic-liberal theorist Karl Popper. Focus of political concern: communitarianism vs. individualism. These labels are preferred to the loaded language of "totalitarianism" (anti-freedom) vs. "libertarianism" (pro-freedom), because one can have a political focus on the community without being totalitarian and undemocratic. Council communism is a political philosophy that would be counted as communitarian on this axis, but is not totalitarian or undemocratic. Responses to conflict: according to the political philosopher Charles Blattberg, those who would respond to conflict with conversation should be considered as on the left, with negotiation as in the centre, and with force as on the right. See his essay "Political Philosophies and Political Ideologies". Role of the church: clericalism vs. anti-clericalism. This axis is less significant in the United States (where views of the role of religion tend to be subsumed into the general left–right axis) than in Europe (where clericalism versus anti-clericalism is much less correlated with the left–right spectrum). Urban vs. Rural: This axis is significant today in the politics of Europe, Australia and Canada. The urban vs. rural axis was equally prominent in the United States' political past, but its importance is debatable at present. In the late 18th century and early 19th century in the United States, it would have been described as the conflict between Hamiltonian Federalists and Jeffersonian Republicans. Geopolitics: Relations with individual states or groups of states may also be vital to party politics. During the Cold War, parties often had to choose a position on a scale between pro-American and pro-Soviet Union, although this could at times closely match a left–right spectrum. At other times in history relations with other powerful states has been important. In early Canadian history relations with Great Britain were a central theme, although this was not "foreign policy" but a debate over the proper place of Canada within the British Empire. International action: multilateralism (states should cooperate and compromise) versus unilateralism (states have a strong, even unconditional, right to make their own decisions). Political violence: pacifism (political views should not be imposed by violent force) vs. militancy (violence is a legitimate or necessary means of political expression). In North America, particularly in the United States, holders of these views are often referred to as "doves" and "hawks", respectively. Foreign trade: globalization (world economic markets should become integrated and interdependent) vs. autarky (the nation or polity should strive for economic independence). During the early history of the Commonwealth of Australia, this was the major political continuum. At that time it was called free trade vs. protectionism. Trade freedom vs. trade equity: free trade (businesses should be able trade across borders without regulations) vs. fair trade (international trade should be regulated on behalf of social justice). Diversity: multiculturalism (the nation should represent a diversity of cultural ideas) vs. assimilationism or nationalism (the nation should primarily represent, or forge, a majority culture). Freedom: positive liberty (having rights which impose an obligation on others) vs. negative liberty (having rights which prohibit interference by others). Social power: totalitarianism vs. anarchism (control vs. no control) Analyzes the fundamental political interaction among people, and between individuals and their environment. Often posits the existence of a moderate system as existing between the two extremes. Change: radicals (who believe in rapid change) and progressives (who believe in measured, incremental change) vs. conservatives (who believe in preserving the status quo) vs. reactionaries (who believe in changing things to a previous state). Origin of state authority: popular sovereignty (the state as a creation of the people, with enumerated, delegated powers) vs. various forms of absolutism and organic state philosophy (the state as an original and essential authority) vs. the view held in anarcho-primitivism that "civilization originates in conquest abroad and repression at home". Levels of sovereignty: unionism vs. federalism vs. separatism; or centralism vs. regionalism. Especially important in societies where strong regional or ethnic identities are political issues. European integration (in Europe): Euroscepticism vs. European federalism; nation state vs. multinational state. Openness: closed (culturally conservative and protectionist) vs. open (socially liberal and globalist). Popularised as a concept by Tony Blair in 2007 and increasingly dominant in 21st century European and North American politics. As shown by Russian political scientist Stepan S. Sulakshin, political spectra can be used as a forecasting tool. Sulakshin offered mathematical evidence that stable development (positive dynamics of the vast number of statistic indices) depends on the width of the political spectrum: if it is too narrow or too wide, stagnation or political disasters will result. Sulakshin also showed that in the short run the political spectrum determines the statistic indices dynamic and not vice versa. ^ a b c d Knapp, Andrew; Wright, Vincent (2006). "1 French political traditions in a changing context" (ebk). The Government and Politics of France (5 ed.). Taylor and Francis. ISBN 978-0-203-40260-3. France invented the terms Left and Right early in the great Revolution of 1789– 94 which first limited the powers of, and then overthrew, the Bourbon monarchy. ^ Griffin, Roger (1995). Fascism. Oxford University Press. pp. 8, 307. ISBN 978-0-19-289249-2. ^ Eatwell, Roger (2003). "A 'Spectral-Syncretic' Approach to Fascism". In Kallis, Aristotle A. (ed.). The fascism reader. Routledge. p. 71. ISBN 978-0-415-24359-9. ^ Ferguson, L.W. (1941). "The Stability of the Primary Social Attitudes: I. Religionism and Humanitarianism". Journal of Psychology. 12 (2): 283–8. doi:10.1080/00223980.1941.9917075. ^ Kirkpatrick, C. (1949). "Religion and humanitarianism: a study of institutional implications". Psychological Monograph. 63 (9): i-23. doi:10.1037/h0093615. ^ "politics". Retrieved 5 May 2016. ^ a b c d Eysenck, H.J. (1956). Sense and nonsense in psychology. London: Penguin Books. ^ Eysenck, H.J. (1953). "Primary social attitudes: A comparison of attitude patterns in England, Germany, and Sweden". Journal of Abnormal and Social Psychology. 48 (4): 563–8. doi:10.1037/h0054347. ^ Dator, J.A. (1969). "Measuring attitudes across cultures: A factor analysis of the replies of Japanese judges to Eysenck's inventory of conservative-progressive ideology". In Schubert, Glendon A.; Danelski, David Joseph (eds.). Comparative judicial behavior: cross-cultural studies of political decision-making in the East and West. Oxford University Press. ^ Billig, Micheal. (1979) "Psychology, Racism and Fascism", Chapter 6, footnote #70. Published by A.F. & R. Publications. ^ Stone, W.F. (1980). "The myth of left-wing authoritarianism". Political Psychology. 2 (3/4): 3–19. doi:10.2307/3790998. JSTOR 3790998. ^ Ray, J.J.; Bozek, R.S. (1981). "Authoritarianism and Eysenck's P-scale". Journal of Social Psychology. 113 (2): 231–4. doi:10.1080/00224545.1981.9924374. ^ Rokeach, Milton; Hanley, Charles (March 1956). "Eysenck's Tender-Mindedness Dimension: A critique". Psychological Bulletin. 53 (2): 169–176. doi:10.1037/h0045968. PMID 13297921. ^ Lykken, D. T. (1971) Multiple factor analysis and personality research. Journal of Experimental Research in Personality 5: 161-170. ^ Ray JJ (1973) Factor analysis and attitude scales. The Australian and New Zealand Journal of Sociology 9(3):11–12. ^ a b Rokeach, Milton (1973). The nature of human values. Free Press. ^ Rous, G.L. ; Lee, D.E. (Winter 1978). "Freedom and Equality: Two values of political orientation". Journal of Communication. 28: 45–51. doi:10.1111/j.1460-2466.1978.tb01561.x. ^ Mahoney, J.; Coogle, C.L. ; Banks, P.D. (1984). "Values in presidential inaugural addresses: A test of Rokeach's two-factor theory of political ideology". Psychological Reports. 55 (3): 683–6. doi:10.2466/pr0.1984.55.3.683. Archived from the original on 14 May 2013. ^ Eysenck, Hans (1976). "The structure of social attitudes". Psychological Reports. 39 (2): 463–6. doi:10.2466/pr0.1976.39.2.463. Archived from the original on 14 May 2013. ^ Greenberg, J.; Jonas, E. (2003). "Psychological Motives and Political Orientation—The Left, the Right, and the Rigid: Comment on Jost et al. (2003)" (PDF). Psychological Bulletin. 129 (3): 376–382. CiteSeerX 10.1.1.396.6599. doi:10.1037/0033-2909.129.3.376. ^ Mitchell, Brian Patrick (2007). Eight ways to run the country: a new and revealing look at left and right. Greenwood Publishing. ISBN 978-0-275-99358-0. ^ Gregory, Anthony, "What About the 'Real' Left?" Archived 18 June 2015 at the Wayback Machine, Lewrockwell.com, 6 July 2011. ^ "American Federalist Journal - News and opinion about politics, culture and current events". Archived from the original on 15 October 2005. Retrieved 5 May 2016. ^ a b Davis, Otto A.; Hinich, Melvin J.; Ordeshook, Peter C. (1 January 1970). "An Expository Development of a Mathematical Model of the Electoral Process". The American Political Science Review. 64 (2): 426–448. doi:10.2307/1953842. JSTOR 1953842. Since our model is multi-dimensional, we can incorporate all criteria which we normally associate with a citizen's voting decision process — issues, style, partisan identification, and the like. ^ Stoetzer, Lukas F.; Zittlau, Steffen (1 July 2015). "Multidimensional Spatial Voting with Non-separable Preferences". Political Analysis. 23 (3): 415–428. doi:10.1093/pan/mpv013. ISSN 1047-1987. The spatial model of voting is the work horse for theories and empirical models in many fields of political science research, such as the equilibrium analysis in mass elections ... the estimation of legislators’ ideal points ... and the study of voting behavior. ... Its generalization to the multidimensional policy space, the Weighted Euclidean Distance (WED) model ... forms the stable theoretical foundation upon which nearly all present variations, extensions, and applications of multidimensional spatial voting rest. ^ If voter preferences have more than one peak along a dimension, it needs to be decomposed into multiple dimensions that each only have a single peak. "We can satisfy our assumption about the form of the loss function if we increase the dimensionality of the analysis — by decomposing one dimension into two or more"
^ a b Alós-Ferrer, Carlos; Granić, Đura-Georg (1 September 2015). "Political space representations with approval data". Electoral Studies. 39: 56–71. doi:10.1016/j.electstud.2015.04.003. The analysis reveals that the underlying political landscapes ... are inherently multidimensional and cannot be reduced to a single left-right dimension, or even to a two-dimensional space. ... From this representation, lower-dimensional projections can be considered which help with the visualization of the political space as resulting from an aggregation of voters' preferences. ... Even though the method aims to obtain a representation with as few dimensions as possible, we still obtain representations with four dimensions or more. ^ Horrell, David (2005). "Paul Among Liberals and Communitarians". Pacifica. 18 (1): 33–52. doi:10.1177/1030570X0501800103. ^ Blattberg, Charles (2009). "Political Philosophies and Political Ideologies". Patriotic Elaborations: Essays in Practical Philosophy. McGill-Queen's University Press. SSRN 1755117. ^ Diamond, Stanley, In Search Of The Primitive: A Critique Of Civilization, (New Brunswick: Transaction Books, 1981), p. 1. ^ "The new political divide". The Economist. 30 July 2016. Retrieved 24 April 2017. ^ Pethokoukis, James (1 July 2016). "The Closed Party vs. the Open Party". American Enterprise Institute. Retrieved 24 April 2017. ^ Sulakshin, S. (2010). "A Quantitative Political Spectrum and Forecasting of Social Evolution". International Journal of Interdisciplinary Social Sciences. 5 (4): 55–66. doi:10.18848/1833-1882/CGP/v05i04/51654.